Do you leave power saving mode on all the time? Anybody only leave it on at certain times? I use the power saving mode all the time. I dont know whether it really saves your battery or not since I never turn it off and compare the difference. I did early in the day for 2 months. I needed to on my GS2. It dims the screen as the battery gets lower and now I can survive a day without it. I am going to look in to newly downloaded GSAM's power saving when I can be bothered. Leaving your power saving mode on all the time limits the cpu speed, dims the screen and turns off syncing. So it cripples your phone, I rather carry an extra battery. If you set it to auto at least it won't come on until the battery is at 25%. It does not disable sync. Mine is enabled to avoid that vibrating thing. i leave mine on unless im downloading movies on the phone. they download faster if the power saver isnt on. Never. I want to use my phone to the max so nothing gets switched off apart from Bluetooth when I'm not using it. anon8380037 and boudicca00 like this. I am with you on this. What is the sense of paying top dollar for the latest and fastest and then put a 40 mph throttle on it. 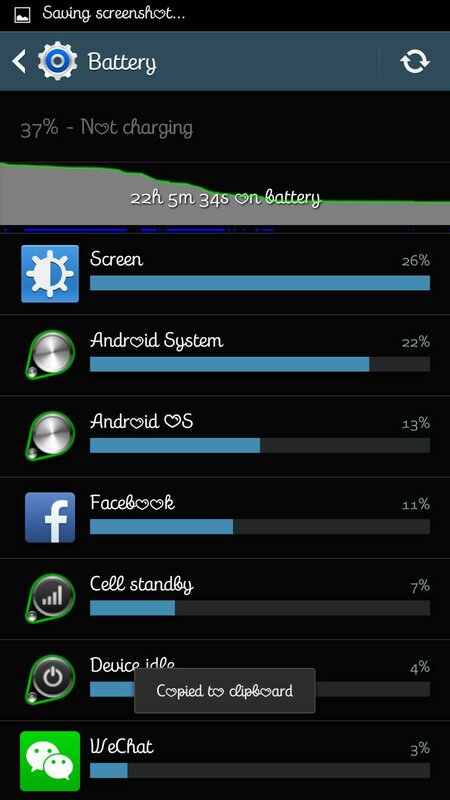 I get 14 to 16 hours per day with standard battery and full power settings and carry a spare battery for backup. Again, I am with you on this. It's useless IMO. It comes on at 20-25 percent? I might as well turn it on when it's about 25 percent rather than just leaving it on? I might have to give it a try and see how it is. How long does your battery last throughout the day? anon8380037 and da3lynx like this. I love your font. Can you tell which it is you have? Thanks! The font is called Madita. But I edited the o to look like a heart/love. I never use it at all. My battery last all day even with heavy use, plus I have 6 batteries anyway. On rare occasions when I don't have enough juice I just pop a fresh one in. I don't get why with removable battery,, battery's are relatively cheap,, why people scrounge for power. So majority of the time I never turn it on. I also use spare batteries which usually will eliminate the need to use this since I can swap.. Those rare times though I can't. I also don't use the power saving mode , but not because I think its useless, but because I really haven't needed to. My phone's battery lasts long enough without the power saving mode enabled. Sent from thr Note 3...and yeah, its spectacular. Nope. I do have the screen brightness at about 40% though. Just right for indoors. I crank it up outdoors in bright sunlight. I bought the zerolemon battery/case. Keep brightness cranked up, and never have a day go by that I can't make it through. How are you charging the spare batteries while using your phone? Having this phone since its release in September I've found I really don't need power save. My average battery life is over 20 hours, with over 8 hours of screen time, 8 email accounts all set to push etc. Not sure how you're only getting < 5 hours of screen on time on this phone @ that %. My phone routinely has 6.5-7 hours screen on time the time it's at 30%, running complete stock software with no Power Saving and Auto Brightness on - under HEAVY usage. The only time I use Power Saving is when I'm traveling. I'll set it on to stretch out a bit more usage out of my phone, because I do not plug in at airports for fear that I'll mess up and leave my phone sitting there for some reason, and "lose" it. Maybe because im using network all the time and not a stable connection like wifi. 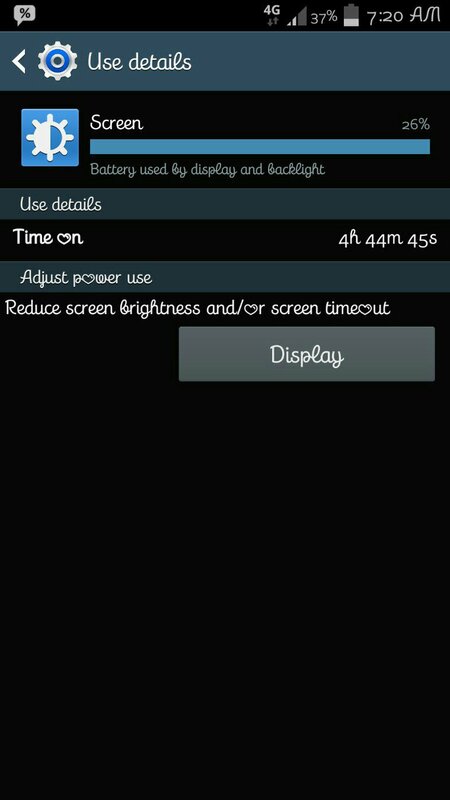 I used to get 4 hours of screen on time only on JB. So 5 hours is an improvement to me. Lol. Has the S5 not having 64-bit processing been a big deal for any of you?